Our personal flock recently had its very first illness, and I am 100% to blame. In seven years, we’ve had to worm our flock ONCE. That’s the single solitary health problem we’ve ever had. Then, I had to go and get dumb. Me: How long does it take your bedding to compost down like that? Her: Shrugs. A few months. Me: Mine takes FOREVER to break down that well. What’s your trick? Do you use that compost starter stuff? Her: I bed my chickens on hay because pine shavings take too long to decompose. Sure, I know that hay is not a good bedding material. I’ve been telling you all that for years. But, I never tried it. Could it really hurt all that much? Hay is cheap, I figured–no harm in giving it a try just to see what happens. Maybe it’ll be awesome! Of course, you all know what happened. The hay didn’t absorb the poo and moisture very well. I didn’t change it often enough, thinking I could treat it like pine shavings. My coop got too damp. My chickens got sick. First came the sneezing, then the side-to-side head shaking, then the chest-rattling. Some of my hens became listless. I was worried and feeling like a total moron–which, of course, I kind of was. Enter the coolest vet, Dr. Kimberly McClure Brinton, a backyard, free-range, pet chicken keeper herself. She came out to our coop, checked the chooks’ mouths for phlegm, eased a thermometer up their you-know-where to check for fever, and listened to their breathing with a stethoscope. She checked for mites and gathered stool samples for the lab, to check for intestinal parasites, which weaken the immune system (we didn’t, even though we free-range our birds!). After extensive examination, Dr. Kim determined that our respiratory problem was pretty mild, and limited to the upper respiratory tract. It would be very expensive and time-consuming to figure out the exact cause–bacterial or viral–and we couldn’t wait to find out before we started treating them, for fear they’d worsen. She advised us to treat them with the antibiotic Oxytetracycline. If they weren’t improving after 3-4 days, she’d move us on to Tylan. And, at some point during the antibiotic treatment, I remembered: that lovely small farmer said she changed her bedding once a week. She looked at me like I was an alien when I told her I change mine every month or more–and it’s no wonder. SHE was smart. SHE moved their poop on out before it got too damp in her coop. I probably let it go 3-4 weeks. Bottom line: I knew better than that. And I’m slightly embarrassed, but not too ashamed to tell you about it, because I hope to prevent you from making the same mistake. Since then, I’ve been researching ways to kick-start the composting process on my spent bedding. We already turn it occasionally; we add all sorts of kitchen compost including egg shells; we add water when we feel it’s too dry. The Seattle Tilth website has some good general rules of thumb for composting chicken poo, which we loosely follow. What interests me is this issue of whether to add a compost starter–the beneficial micro-organisms that start the breakdown process–or whether simply adding some dirt on top of the old, poopy shavings you’ve removed will suffice. What do you do, readers? How do you compost your chicken bedding? How’s it working out for you? Finally, I’ve learned two things about pine shavings that make them more attractive. First, I can change them less frequently if I take a shovel and turn the bedding every so often, to keep them from getting compacted or too wet in any one area. Second, many plants including blueberries love both shavings and chicken manure–and we love blueberries–so we’re now “prepping” a 30′ x 30′ patch for an autumn blueberry bush planting by dumping our spent shavings on it. Easy peasy. I guess pine shavings aren’t so bad, after all. An idea for your compost – in our class we have a lab where we work on how to increase composting efficiency. Now, we are composting with red wiggler worms – so this may or may not help you. But – some of our tips that we’ve learned include: if you have wood bedding chips – make sure to have other “brown” compost, like shredded papers or leaves. We try to do 50/50 or even more, as the more we can surround our wood with, the quicker it seems to help the wood break down. Also, we do have a steady supply of veggie scraps that we introduce each week. Since we have worms, we don’t turn the beds – but when adding the new veggie scraps we will evaluate the moisture level of the bed. Too wet – add some more shredded paper/leaves. Too dry – add some moisture or more veggies. We keep our compost contained in tubs, and then harvest once it turns black and crumbly. We’ll scoop out the worms to keep (or just move the pile over and add new delicious veggie scraps to once side – wait a week for the worms to find it – and then just take the other compost to our garden). When composting outside, we’ve found it’s best to compost in a pile if you can – especially if you can put the pile inside of something (like wood walls) – which helps to keep it moist in our very hot summers here. Outside piles, we even wet down with the hose periodically because they dry out so fast, which slows down composting. Thanks for your comments! I love vermicomposting, and I’ve done it in the past, although I found they didn’t consume terribly much. I must have done something wrong, though, because other people have had such good luck with it. Les from MPC has blogged a few times about vermicomposting, too, and installment 3 in his series will be coming up soon. We use and recommend straw in our coop and have never had problems. 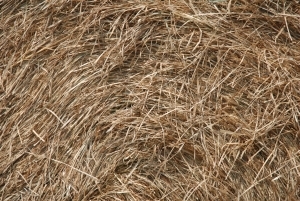 In our very humid, very warm climate the straw is the perfect coop bedding. We toss extra straw on top about every month or so, but we never turn the straw. Once a year we remove the straw and place it around and under our banana plants OR put it into the general compost bin for a bit of cooking. If any of the bedding in the nest box gets dirty (from the occasional broken egg when a hen is not careful!) we just change it out and toss the dirty straw onto the coop floor. Our coop is open air, meaning that there is a great deal of airflow around the straw and the coop. The straw in the wire-topped run decomposes after just a few weeks but we only put it out there for the visual effect, so that does not bother us. Conventional wisdom says straw harbors mites, and I know some people have had problems with their chickens eating the straw and getting compacted crops. Excellent that you haven’t had problems–it’s much easier to compost, too! We do the layering thing, and I admit we do not turn our pile often enough. I have going to go get some red wigglers tomorrow to add just for good measure. Also a question. In adding the shred, can this be the shreaded junk mail I accumulate too much of? I wouldn’t–the dyes can be harmful, unless you see someplace on the paper that says vegetable-based inks were used. Plain, undyed cardboard can be okay, though. Check out Les’s blog posts on vermicomposting, too. Full of good information! I have 6 girls that are 3 & 4 years old & 15 that will be 1 in Aug. Also got more chicks on the way next month!! I have always used “Super Clean” pine shavings in my coop for Carly, Maxie & Lulu and for the last 2 1/2 years they have been fine. I clean out poop every morning, adding pine shavings as necessary and completely change out all shavings about every 2- 3 weeks. My chickies are happy and healthy. They do free range most of the day here in sunny Santee, CA!!! I use 1/3 DE, 1/3 PDZ, 1/3 sand on my poop shelf. I scoop it daily and add it to my general compost along with the goose droppings that I rake up from the goose pen. When I rake the pen the goose droppings get covered with the sandy soil in the pen. I have the compost contained with wooden palletts I occasionally hose the pile down with water. It makes the best compost. I use it on my flowers and my neighbor uses it on her vegetables. Chicken poop can be very “Hot” unless it is composted and mixed with other ingredients. I also add my pine shavings when I clean my coop. This is exactly what I’ve been looking for. No one could help me, not even MPC. My hens *and now the pullets and cockerels* are sneezing, head-shaking and one’s wheezing. It must be a mild case, but it’s clingy. I use wood shavings, pine, I think, but the coop floor is dirt, and water seeps under it when it rains. How can I stop that? I think it’s mold or something from the wet shavings, poop, feed. I scoop it daily, but they love slinging things. Unfortunately we’re not able to offer veterinary advice, for liability reasons, and also because we can’t make proper diagnoses from afar. You’ll want to see a vet. If you can’t for some reason, you might try Oxytetracyclene, as our vet instructed us to do. Remember to follow all manufacturer instructions, keep it out of the reach of children, and throw out eggs all 10 days of treatment plus at least 5 days after, as the antibiotic does pass through to the egg. Good luck! 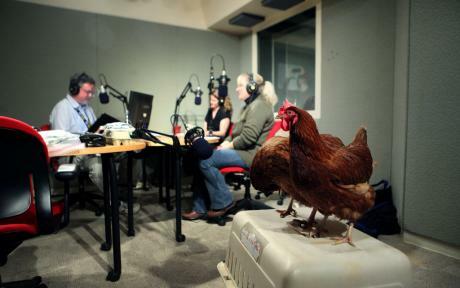 I mean the MPC chicken health and FAQs. We are thinking of getting chickens so I started reading some blogs….I have an observation to share for what it’s worth, about composting. I’ve been doing it for several years after watching my Mom do in in N.C. in the layered fashion. My neighbors here in south Tampa are VERY fussy so I contain the compost in an old cylindrical pool filter which I roll around the yard, sometimes leaving it in one spot with the opening down to exchange microbes (at least in my mind that’s what is happening) I put all organics, food, clippings, leaves, good paper in and it’s black and crumbly in 2 months-(I’m not kidding) and I never add moisture. I show it off to Everyone! I have been using a deep bed of sand in my coop….the kind in sandboxes. I go through it with a sifter every couple days and scratch it to keep it loose. Do you see any problem with that? Some people love sand as a bedding material. We haven’t tried that. Personally, I would miss the great compost we get from biodegradable bedding! However, you can find more information on using sand as bedding here. This is my 1st year with chickens, I have 11 that are 6 weeks old. I read about Sweet PDZ so bought 2 bags from TSC. Has anyone else used it and what were the results? I am still using pine shavings and cleaning everyday. I am hope with PDZ I can scoop the poop a few times a week and change every 3 weeks. From what I’ve heard, on using the sand in the run is that you can rake it kind of like you are getting the lumps from a cat litter box…gather it and throw it into the compost…or just turn it under for another day….is this correct? Heard a lot of good things about it. I’ve seen that, too, and I’ve thought about adding sand to my run as well. You’d think it would prevent the ground from getting too compacted, as well, and that it would help water drain. If you try it, please let us know how you fare! Linda – did you try the sweet PDZ ? Before I buy the large bag I was hoping to hear from you about your results. Sure would appreciate knowing. For now I dust the area with Feed Grade DE then use straw…I add extra straw during the week each day, as the moisture level varies each day depending on what the Girls were given to eat. If I stick with laying crumbles, it is fairly dry but they do love those snacks ! Clean out is usually once a week, but if it goes to the second week, there is a smell – so trying to be polite with my neighbors in this residential area and would like to add PDZ to control moisture and odor. Any luck ? Could someone tell me what is DE and PDZ? I use shavings and the pellets made for horse stalls which I compost, but I would like to know what you are taking about.